JERUSALEM – Marxists, socialists and communists have created a safe space online to congregate, exchange ideas – including a stated revolution against the U.S. “oppressive” regime – and support their favored presidential candidate. Their meeting spot? Sen. Barack Obama’s official campaign website, which allows registered users to form groups and post content in online “community” blogs. “This group is for self-proclaimed Marxists/Communists/Socialists for the election of Barack Obama to the Presidency. By no means is he a true Marxist, but under Karl Marx’s writings we are to support the party with the best interests of the mobilization of the proletariat,” states the groups charter. “We support Barak Obama because he knows what is best for the people!” exclaims the group’s online creed. 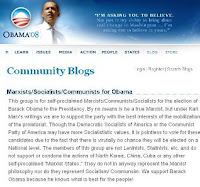 And on Obama’s site, the declared Marxist, communist and socialist bloggersrant against such varied targets as Republicans, capitalism and the Fox News Channel. According to author profiles, the bloggers range from registered voters to underage high school students who state they are looking to foment revolt. In a posting titled “The Nature of the Proletariat,” one group member calls for revolution against the U.S. “oppressive” regime. seemed to have assimilated with the Proletariat. proves that the Revolution is inevitable. “Eventually, the bourgeoisie controlled government will fail to keep the ever growing masses at bay, and the Revolution will occur,” adds the posting. Another posting by a registered group member calling himself “The Chalk Graffiti Terrorist” argues on Obama’s site against the “evils” of capitalism. One group member urges Obama site readers to support the Fair Tax bill, which calls for the abolishment of the IRS and for the income tax to be replaced with a national consumption tax. The bill has some support across the U.S. political spectrum, including with some Republicans. It was not immediately clear whether Obama’s website staff approves new groups registered on his site. 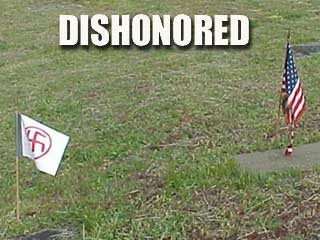 His campaign did not return WND e-mail and phone requests for comment. While the website carries a disclaimer that it does not monitor all blog posts, the site doesn’t state whether staff approve new groups. Obama spokesmen previously have stated the campaign cannot monitor all content posted on blogs, but it promptly removes content brought to its attention that is deemed inappropriate or hateful. Yesterday WND reported a blog posting on Obama’s official campaign site urged Americans to take action to secure the release of imprisoned terrorist fundraiser Sami Al-Arian, comparing the controversial former professor to Martin Luther King and Malcolm X. The posting, which has been removed since publication of the story, is just a sampling of a large volume of racist, anti-Semitic and pro-Palestinian rhetoric published on the user-friendly MyObama community blog pages. One recently removed posting claims Jews control the media. Another referred to Jews as “puppet masters” and “war criminals.” Yet another posting, titled “The Israeli connection to 9/11,” claimed Israeli intelligence was involved in the mega-attack and planted “false flags” to blame Arab countries. A popular topic on Obama’s site apparently is the so-called Israel Lobby. I can’t find an embed link for this commercial, so I’ll post the link. Go here and watch the commercial then come back. Okay, have you viewed it? Good. Why am I writing on MoneyGram? Quite simply, this commercial is deeply disturbing on several different levels. First, the underlying message seems to be the advocacy of a world currency. I don’t like that. Second–the scenes where the people are all reaching to the sky–if you pay attention, it seems to be a “Sieg Heil” salute. THAT disturbs me–as if these people are brainwashed into accepting an international, world currency and are approving it in a Nazi like manner. I’m cross posting this from Right In a Left World. This is absolutely obscene and edwards’ anti-war crap is directly responsible. I know how disgusted our troops are, defending these criminals’ right to free speech while the criminals desecrate the memories of those that have gone before to insure our freedom. Dammit people, get off your asses and start demanding some punishment for these animals! Quit sitting around in your complacent, apathetic lives and do something! And if you don’t, don’t be surprised when YOU’RE next and YOUR freedoms are taken away to satisfy these assholes in the name of free speech! 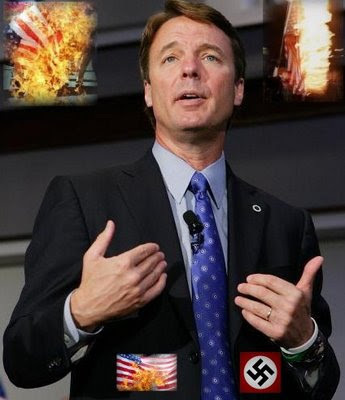 As posted before, the “Breck Girl,” Democrat former Senator and presidential hopeful, John Edwards, called on supporters to Support The Troops, End The War by displaying anti-war material at Memorial Day events today, on Memorial Day! Several people, from both the right and left political spectrum condemned this call as a bad idea, knowing full well that, as often happens things go too far. As expected, that is what happened this morning in Orcas Island, Washington, the second-largest member of the San Juan archipelago, a string of islands located at the northwest tip of the state. Best known for kayaking opportunities and whale watching, the string of Islands of less that 10,000 population is ordinarily a sleepy quiet community. 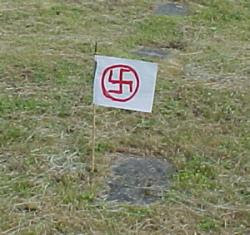 That wasn’t to be this morning when vandals not only took American Flags off of the graves of Veterans and burned them, but replaced them with hand drawn Swastikas both on Sunday and again on Monday, Memorial Day! 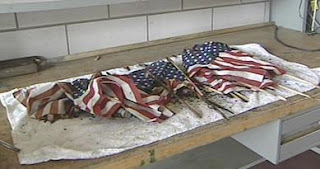 Oakdale Minnesota saw this also happen this morning when a woman there woke up to find one of her Flags in a pile of ashes on her lawn. She says she feels threatened and intimidated by this violation of her homeowner rights and freedom of expression. I know the leftinistra will say there is no proof of this being Edwards Supporters and so far, that is true. Police are lifting fingerprints and seeking the vile scum that perpetrated this hate crime. But don’t forget, it was Edwards who put out the call highjacking Memorial Day. I’m sure Edwards will issue the obligatory condemnation, no matter how hollow, that he doesn’t support these acts, but Edwards did ask people to make their statements known today and to send him photos to display of their acts. 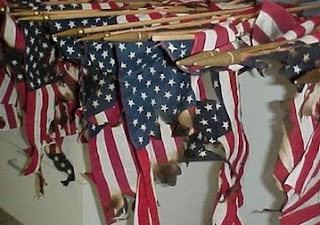 Now, I wonder if Edwards will display the fruits of his call for protest photos that he asked to be sent to him?